At long last, the U.S. Consumer Products Safety Commission has officially announced the manufacturer recall of the Samsung Galaxy Note 7. The agency says that U.S. consumers with the phone need to power them off and contact their wireless operator, the retail store, or Samsung depending on where it was purchased. The CPSC says that only those units with an affected battery are subject to the recall, which makes up 97% of the units shipped in the U.S. To determine if your phone has been recalled, you will need to find the IMEI number of your specific device, and call Samsung. If it is part of the recall and you bought it from your carrier, take it back to them. 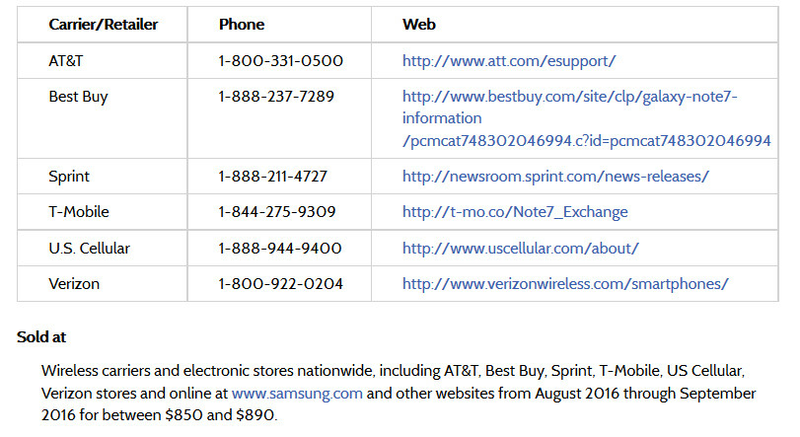 If you purchased your Note 7 from Samsung, you will need to speak to the manufacturer about how to exchange it. Samsung's earlier decision to recall the phone itself was not successful as it led to confusion among consumers. A CPSC spokesman appeared not to be too pleased with how Samsung handled the matter. "As a general matter it’s not a recipe for a successful recall for a company to go out on its own. In my mind, anyone who thinks that the best way for a recall is for a company to go out on its own needs to have more than its phone checked," a CPSC spokesman said today. The Samsung Galaxy Note 7 was originally launched on August 15th, and quickly there were reports of explosions being caused by the phablet, mostly while the device was charging. As we told you earlier today, the new Galaxy Note 7 models will feature a green battery indicator on the top of of the unit instead of the usual white icon. These units could be available in the U.S. as soon as next Monday, September 19th. Contrary to the belief of many members on here, Samsung has not done a good job handling this whole situation. It should have been recalled right away. It's a serious situation, and one that i hope Samsung can recover from. Agreed, but the Note 7 is finished. The Note7 is nowhere near finished. I mean, don't you get up, when you stumble? Once you fall down, it doesn't necessarily mean you're finished. They only sold 400k units in the U.S. which is pretty sad for a major flagship release, and that was before the exploding Note7 made the news. Looks like it was a DOA launch anyway, and this huge battery issue just made it a lot worse. Can't win every year. I wouldn't call it sad, buy it sure is telling. I recall a certain fanboy claiming the Note would out sell every smartphone this year........oh how the mighty have fallen. Regardless, I'm gonna pick up an S6 Edge off Swappa to prepare myself for the curved iPhone....... and I'm not gonna hold this against Samsung when making my purchasing decisions UNLESS it continues after they are reissued. *but it sure is telling. That's was just a week , maybe not even a week and then word of the phones started coming in. If that would not have happened it would have been way more. Finished for you... OK. I'm still waiting the release.. so is not finished for me, for sure I'm not the only one. Was Volkswagen finished after recall? Honda?? Does Samsung has only Note7 device? "Samsung has not done a good job handling this whole situation. It should have been recalled right away" What difference would that have made? It wouldn't have prevented more explosions from occurring, nor would it have better informed consumers, it'll only make it illegal for stores to keep selling it. It would have made a HUUUUUUGGGGGEEEE difference if they had an official recall right away. What difference!? HUUUUUUGGGGGEEEE difference on who to blame for the explosion? That's useless to the affected consumer. Thanks for sharing that source, not sure why you couldn't do that in your first response. Now I see where they could have done it better from the start. 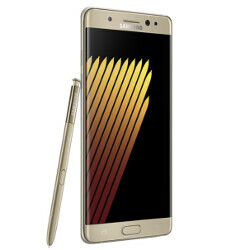 They did immediate communication from September 2nd, but it was ambiguous: "For customers who already have Galaxy Note 7 devices, we will voluntarily replace their current device with a new one over the coming weeks" They should have stated it plain and clear that customers should stop using the device immediately, and return it. Instead, this ambiguous statement confused some people into thinking the return is voluntary, and not very serious. Samsung got on it pretty fast and I don't see what was confusing about it. They told people to stop using them and take them back, what's confusing. The phone was released August 15th. There was a total of 2.5million devices moved at launch. Then when a fraction of a percent of phones fail; Samsung has to investigate before recalling. It is now September 16th and the recall and restocking is already underway and almost done. By the way this was done on a global scale; so please tell me how Samsung did a bad job for all this to happen in a 30 days time??? Uhhh, why are you writing so many comments separately? Just write one. Anyway, that was about time the authority took the issue into it's own hands. Samsungs effort was basically useless, people were confused, didn't know the severity of the matter. Hopefully all the confused customers and those reluctant fanboys will just go for an exchange or a refund. The recall isn't available for all countries. In the Middle East if you haven't purchased your note from an authorized Samsung reseller you can't return the device and you are totally screwed. Screw Samsung for screwing over their costumers . The same can be said for any other OEM. It's the reseller's duty to get you a new Note7 or refund.